Beryl Markham was the first woman to fly solo across the Atlantic east to west. But before it even occurred her to to fly, she was a successful racehorse trainer. This unconventional woman was British-born but grew up in Kenya, and her early life is the subject of Paula McLain's forthcoming novel. As a girl, Beryl was at home in Kenya, even as her mother gave up and returned to England with Beryl's brother. Left behind, Beryl and her father worked together training horses as she grew up. Her best friend was a native boy from a local village, with whom she was close even in adulthood. Growing up in a place without the benefits or restraints of society undoubtedly contributed to Beryl's independent, fearless nature. Thin on plot, the novel is more about this character trying to find herself. This is not to say that it was uneventful - a lot happened! Beryl had many affairs, friendships and changes in her life. But like real life, there's not a strong story arc. This novel is more about this amazing character and her complicated feelings and unconventional life. Beryl struggled to find her place, while breaking barriers that blocked most women from achieving similar successes. She also had many romances, but not a lot of love, marrying too early then spending a great deal of time and energy freeing herself of it. Despite her strong will, I was struck by the times when she had to give in, because sticking to her guns would mean losing what was actually most important to her. It seemed so unfair. Almost as important as Beryl herself was the setting of 1920s Kenya. I can't imagine what it must be like to leave the place of your birth and grow up in a completely different country that becomes your home more than the country you are from, but it undoubtedly shaped her. Several of Beryl's British-born acquaintances made reference to how everything was different in Kenya. The messy affairs that were somehow ok in this untamed country would never have been tolerated back in Britain. I got the feeling that they liked the freedom of making their own choices, while also acknowledging that they were willing to endure more hurt and disappointment than they would at home. Having read The Paris Wife, I wasn't sure how this one would compare. It's another historical novel of basically the same time period, also based on the life of a real person. Could it possibly be as good? I shouldn't have worried, because as it turns out I was captivated from the very first page. I'm not sure how much of it is true, though it appears the basic facts of Beryl Markham's life are represented here. I maintain my slight confusion in trying to separate fact from fiction in novels based on actual people, but that didn't stop me from enjoying every bit of this one. 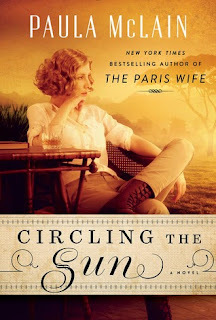 Circling the Sun will be available on July 28. I received my copy courtesy of Random House. I was not compensated for this review.